Subject to an earlier dissolution of Parliament, a general election must be held on the third Monday in October in the fourth calendar year following a previous general election, with the first general election to be held on Monday, October 19, 2009. Well okay it should have been today, except that Harper took us into an election early, violating his own law. Instead in a cynical ploy to grab power the Harpocrites ran an election saying there was no recession, they would not raise taxes nor would they have a budget deficit...my my how things changed after they were elected with another minority government and the economy crashed. Harper then prorogued the government within two months of that election in order to avoid being ousted by an opposition coalition, while still denying there was a recession. Today with the threat of another election still in the air one has to ask why the rush last fall if not for the fact that actually the Harpocrites have been ready for an election since they won a minority in 2006. Every day is election day for them. They are not ruling as a government but as a party running a party campaign around the economic issues they denied were a reality last fall. Mr. Speaker, I am very pleased to begin debate in third reading on Bill C-16 – An Act to amend the Canada Elections Act – which would provide for fixed date elections. First of all, I would like to note that the Bill was carefully reviewed by the Standing Committee on Procedure and House Affairs. A range of expert witnesses has appeared before the Committee and much discussion has taken place. The Committee heard from the Chief Electoral Officer, representatives of political parties, academic experts, as well as me. While I have been informed that there were lively debates on key issues, I am pleased to note that Bill C-16 carried in Committee without amendment. Moreover, while there were some minor differences on some of the details of the Bill, I was struck by the fact that all parties represented in the House of Commons support the fundamental rationale of the Bill. I believe that all parties share the view that elections belong, fundamentally, to citizens. They belong, Mr. Speaker, to the people. All parties agreed with the principle that the timing of elections should not be left to the prime minister but should be set in advance so that all Canadians will know when the next election will occur. Mr. Speaker, today I will begin with a description of the current process for calling general elections and I will discuss some of the difficulties associated with it. This will be followed by a discussion of the many advantages associated with fixed date elections. Finally, Mr. Speaker, I will be very pleased to present the specifics of Bill C-16. Today, it is the prerogative of the Prime Minister, whose government has not lost the confidence of the House of Commons, to determine what he or she regards as a propitious time for an election to renew the government’s mandate. The Prime Minister then requests dissolution of the House from the Governor General and, if the Governor General agrees, he or she proclaims the date of the election. What we have, Mr. Speaker, is a situation where the Prime Minister is able to choose the date of the general election, not based on what is in the best interest of the country, but what is in the interest of his or her party. Bill C-16 will address this problem and will produce a number of other benefits. Mr. Speaker, before going into the details of the bill, allow me to discuss the key advantages of fixed date elections. Fixed date elections will provide for greater fairness in election campaigns, greater transparency and predictability, improved governance, higher voter turnout rates, and will help in attracting the best qualified candidates to public life. First of all, allow me to discuss the issue of fairness. Fixed date elections will help to level the playing field for those seeking election in a general election. With fixed date elections, the timing of general elections will be known to all. Since the date of the next election will be known to all political parties, each party will have an equal opportunity to make preparations for upcoming election campaigns. Instead of the governing party having the advantage of determining when the next election will take place – an advantage they may have over the other parties for several months – all parties will be on an equal footing. And it’s only fair that each party will have equal time to prepare for the next election and know when it will be. Another key advantage of fixed date elections is transparency. Rather than decisions about election dates being made behind closed doors, general election dates will be set in advance as prescribed by this bill. Once this bill is passed, the date of each election will be known by all Canadians. Predictability is also a key advantage of fixed date elections. Canadians and political parties alike will be able to rely on our democratic election system working in an open and predictable fashion for all general elections. Plans can be made on a reliable basis to prepare for, and respond to, fixed date elections. Mr. Speaker, fixed date elections will allow for improved governance. For example, fixed date elections will provide for improved administration of the electoral machinery by Elections Canada. The Chief Electoral Officer, in majority situations, will know with certainty when the next election will occur and will be able to plan accordingly. This will almost certainly involve greater efficiency at Elections Canada and will, therefore, very likely save money for taxpayers. Political parties will also likely save money as they will not have to remain on an ‘election footing’ for extended periods of time. Moreover, fixed date elections will allow for better parliamentary planning. For example, members of parliamentary committees will be able to set out their agendas well in advance, which will make the work of committees, and Parliament as a whole, more efficient. Yet another reason for adopting fixed date elections is that this measure will likely improve voter turnout because elections will be held in October, except when a government loses the confidence of the House. The weather is generally favourable in most parts of the country. Fewer people are transient. So, for example, most students will not be in transition between home and school at that time and will be able to vote. Moreover, seniors will not be deterred from voting as they might be in colder months. And, of course, citizens will be able to plan in advance to participate in the electoral process, arranging for advanced voting if they plan to be away. An additional benefit is that pre-election campaigns to ‘get out the vote’ will be able to be well prepared, as the organizers will be aware of exactly when the next general election will take place. Finally, I want to mention an advantage that will have resonance to many of those in this chamber. It is a difficulty with the current system that I have witnessed personally (and something I have mentioned in interviews when Bill C-16 was first introduced). Fixed date elections will help to attract many of the best qualified Canadians into public life because it will be easier to plan their own schedules to enable them to stand for election. For many of our most talented Canadians, unfixed election dates make it difficult to plan to enter public life because they simply don’t know when the next election is going to be held. I think fixed date elections can only help in attracting the most qualified individuals to public life. Mr. Speaker, I would like to turn to the details of the bill. • respecting the Governor General’s constitutional power to dissolve Parliament. The bill before us was drafted carefully to ensure that these constitutional requirements continue to be respected. So, the bill does not in any way change the requirement that the government must maintain the confidence of the House. Moreover, all of the conventions regarding loss of confidence remain intact. In particular, the Prime Minister’s prerogative to advise the Governor General on the dissolution of Parliament is retained, to allow him or her to advise dissolution in the event of a loss of confidence. Moreover, the bill states explicitly that the powers of the Governor General remain unchanged, including the power to dissolve Parliament at the Governor General’s discretion. As set out in the government’s platform, this bill is modeled after existing provincial fixed date elections legislation. The legislation is very similar to the approach used by British Columbia, Ontario and Newfoundland and Labrador. Mr. Speaker, it should be noted that the legislation in all of these provinces is working – and working well. British Columbia recently had its first fixed date election (May 17, 2005) and Ontario and Newfoundland and Labrador will soon have their first fixed date elections (October 4, 2007 and October 9, 2007 respectively). In British Columbia, there was certainly no evidence of what some critics have called a “lame duck government”. The government’s bill provides that the date for the next general election is Monday, October 19, 2009. Of course, this will be the date only if the government is able to retain the confidence of the House until that time. So, for example, if the government were to be defeated tomorrow, a general election would be held according to normal practice. However, the subsequent election would be scheduled for the third Monday in October, in the fourth calendar year after that election. And that is the normal model that would be established by this bill. General elections will occur on the third Monday of October in the fourth calendar year following the previous general election. We chose the date very carefully and one of my parliamentary colleagues will provide a full explanation of our choice during the course of this debate. However, in brief, we chose the third Monday in October because it was the date that was likely to maximize voter turnout and to be least likely to conflict with cultural or religious holidays – or with elections in other jurisdictions. This raises an additional feature of the bill that I want to bring to your attention – a feature that provides for an alternate election date in the event of a conflict with a date of religious or cultural significance or an election in another jurisdiction. However, with the introduction of legislation providing for fixed date elections, there is some possibility that, in the future, the stipulated election date will occasionally be the same as a day of cultural or religious significance or an election in another jurisdiction. The Ontario fixed date elections legislation provides that, if there is a conflict with a day of cultural or religious significance, the Chief Elections Officer may recommend an alternate polling day to the Lieutenant Governor in Council, up to seven days following the day that would otherwise be polling day. Using a variation of the Ontario legislation providing for fixed date elections, our bill empowers the Chief Electoral Officer to recommend an alternate polling day to the Governor in Council should he or she find that the polling day is not suitable for that purpose. The alternate day would be either the Tuesday or the Monday following the Monday that would otherwise be polling day. Allowing alternate polling days to be held on the following Tuesday or Monday is consistent with the current practice of holding elections on a Monday or a Tuesday. Mr. Speaker, some Opposition members had concerns that this bill is illusory in that the Prime Minister can call an election at any point up until the fixed date for the election. However, Mr. Speaker, the Prime Minister has to retain his prerogative to advise dissolution to allow for situations when the government loses the confidence of the House. This is a fundamental principle of our system of responsible government. Moreover, if the bill were to indicate that the Prime Minister could only advise dissolution in the event of a loss of confidence, it would have to define ‘confidence’ and the dissolution of the House of Commons would be justiciable in the courts – something that we certainly do not want. Mr. Speaker, this bill providing for fixed date elections is long overdue in Canada. In June, Ipsos-Reid released the results of a poll which showed that 78% of Canadians support the government’s plans to provide for fixed date elections. You may know that the third week in October is already Citizenship Week in this country where we celebrate what it means to be Canadian citizens. Of course, fundamental to being a Canadian citizen is our civic responsibilities, including our duty to vote. It is fitting, then, that general election dates will be set for the third Monday in October. This legislation will provide greater fairness, increased transparency and predictability, improved policy planning, increased voter turnout, and will help to attract the best qualified Canadians to public life. I hope my colleagues on both sides of the House will join with me in supporting it and I look forward to the Bill’s speedy passage in the Senate. There are more mercenary forces, euphemistically called 'contractors', in the American war zones of Iraq and Afghanistan then regular U.S. armed forces. They will remain behind when regular U.S. forces withdraw. Mercenaries today operate in Iraq and Afghanistan, supplementing U.S. troop strength and guarding diplomats. In the spring of 2008, 180,000 private contractors worked in Iraq; by the spring of 2009, 68,200 were operating in Afghanistan. These “soldiers of fortune” treat each new posting as a “tour of duty” (a term used by a former Blackwater employee working in Afghanistan). Their deaths and casualty numbers are not included in the official Department of Defense numbers. According to new statistics released by the Pentagon, with Barack Obama as commander in chief, there has been a 23% increase in the number of “Private Security Contractors” working for the Department of Defense in Iraq in the second quarter of 2009 and a 29% increase in Afghanistan, which “correlates to the build up of forces” in the country. However the irony is that even the regular US forces are now acting not in defense of American idealism but in the pragmatic protection of Chinese foreign investments in these countries. When America reduces its regular armed forces in these war zones the mercenaries will be left behind to protect corporate interests not only American but Chinese. China showed little interest in Afghanistan throughout the 20th century but its growing energy and natural resource demand combined with increasing Afghan openness to foreign investors have alerted Beijing of the country’s potentials. This growing interest was particularly manifested with Beijing’s giant $3.5 billion investment in Afghanistan’s Aynak copper field late last year, the far largest foreign direct investment in Afghanistan’s history. Reports from Kabul also indicate that additional Chinese investments are underway. Although these investments may be the engine in Afghanistan’s economy, the Chinese piggy-backing on ISAF’s stabilization effort is bound to be unpopular in the U.S. and Europe, though not necessarily with the Afghan government. In making the case for converging U.S. and Chinese interests in Afghanistan, Robert Kaplan wrote last week in a New York Times opinion piece that, "The problem is that while America is sacrificing its blood and treasure, the Chinese will reap the benefits. The whole direction of America’s military and diplomatic effort is toward an exit strategy, whereas the Chinese hope to stay and profit." In the op-ed, titled "Beijing’s Afghan Gamble," Kaplan also noted, "China will find a way to benefit no matter what the United States does in Afghanistan. But it probably benefits more if we stay and add troops to the fight." No doubt the discussion will boil over after James Yeager, an American geologist, and former congressman Don Ritter, who has an advanced degree in metallurgical engineering and studied in Moscow, hold a press briefing in Washington on Thursday. The event is provocatively titled, "Report on the Aynak Copper Tender in Afghanistan: How China Won and the West Lost." Q: On Nov. 20 in 2008, the Afghan Industry and Mines Minister, Ibrahim Adil divulged the name of the winner in the tender for the largest Aynak copper mine. The China Metallurgical Group company, offering $3 billion, won the tender. Did this Chinese company make investments? How do you evaluate the future relations between Afghanistan and China? A: Yes, the Chinese company has made these investments, and on July 10, the ceremony took place to mark the start of production of copper at the Aynak mine. This is the biggest investment in Afghanistan. If we take into account the number of the unused mines in Afghanistan, it will become apparent that China has huge potential for investment in Afghanistan. Along with the increase of China's influence in the region, it will serve peace and stability in the region as a whole. Q: China and the United States are the strategic and economic rivals. What can You say about the impact of this rivalry on Afghanistan? A: The United States and China are working closely together in Afghanistan. Currently, Afghanistan has become a center of international cooperation. China is friendly neighbor for Afghanistan. Afghanistan is an independent country and determines how to build relations with other states. On the other hand, our strategic allies support the economic development of Afghanistan and the whole region, including China. Q: China, taking advantage of its position and opportunities, helps Afghanistan to join the Shanghai Cooperation Organization (SCO). Is China concerned about the presence of NATO in Afghanistan? A: China is a neighboring country that has never had problems with Afghanistan and, therefore, intends to increase cooperation with our country. China supports Afghanistan's political development. China's investment in Afghanistan's various projects can testify this fact. We invite China to invest. Creating a "trade corridor" will further develop relations. With regard to the NATO presence, I can say that the alliance troops are in Afghanistan under the UN Security Council resolutions. China is also a member of the UN Security Council. As to China's concern about the presence of NATO in Afghanistan, I can say that we do not feel such concern. China supports the presence of international forces in Afghanistan because it actively fights against terrorism, which is a threat throughout the region. This article assesses the significance of China’s recently announced investments in large copper and oil development in Afghanistan and Iraq respectively, with potential significance not only for development and peace in the two war-torn nations, but also for China’s global role and the US-China relationship. With foreign and domestic investment in both nations barely trickling in despite UN, World Bank, NATO and US efforts, the Chinese plans are highly significant. They are indicative not only of China’s aggressive search for energy and resource development opportunities, but also of a shift in US goals in the two countries: while all signs pointed to earlier US attempts to monopolize control of Iraqi oil for American companies, under present strategic conditions, the US appears to more than welcome the Chinese initiative. Oil contracts could spell a win-win situation for both China and Iraq. The contract for Rumaila is key to Iraqi plans to breathe new life into a sector rich in reserves, but desperate for foreign cash to overhaul broken down facilities and obsolete practices. While Chinese oil giants are seizing the opportunity to invest and expand overseas. Iraq has proven crude reserves of 115 billion barrels, ranking number three in the world after Saudi Arabia and Iran. But among the 80 oil fields, only 20 have been developed. Iraq opened its oil fields to foreign companies for the first time in June this year, putting six oil fields and two gas fields on auction. Many bidders turned up. But with many put off by instability in local security, only Rumaila found partners. The Iraqi government says the second round of bidding for oil contracts is due in the first half of December. And the government says it's committed to offering better security and all facilities needed for investments by foreign companies. Meanwhile, Chinese oil giants are also expanding investment in the country. Earlier this year, China's largest oil refiner Sinopec bought Addax Petroleum for about seven-and-a-quarter billion US dollars, to secure the Swiss oil explorer's high-potential oil blocks in West Africa and Iraq. 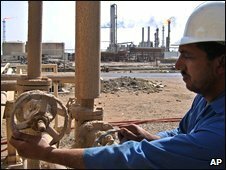 Iraq's cabinet has ratified a deal with two foreign energy companies to develop the giant southern oilfield in Rumaila. The contract with Britain's BP and CNPC of China is the first major deal with foreign firms to be signed since an international auction in June. The successful joint bid by BP and China National Petroleum Corp (CNPC) to develop an oilfield in Iraq has offered unique opportunities for the Chinese company to tap crude reserves in the oil-rich nation, analysts said yesterday. But domestic oil producers should prepare themselves well for any uncertainties in the war-torn country, which boasts of the third-largest oil reserves in the world, they added. Iraq on Tuesday made its first auction of major oil contracts since the 2003 US-led invasion. A consortium by BP and CNPC was finally awarded a contract to develop the Rumaila oilfield, the largest of six oil and two natural gas fields in the bidding. The BP-CNPC group beat a bid from a consortium by Exxon Mobil and Malaysia's Petronas for the oilfield. It was the only successful bid in Tuesday's auction. Besides CNPC, China's two other oil majors, Sinopec and CNOOC also took part in Tuesday's auction. Rumaila is the workhorse of Iraq's oil sector, with a current capacity of 1.1 million barrels per day (bpd) out of Iraq's total national output of 2.4 million bpd. With a foothold in Iraq, China can diversify its oil supplies to enhance energy security, said Lin Boqiang, professor, Xiamen University, adding that the consortium model can reduce risks both for BP and CNPC. China, which became a net oil importer 16 years ago and which relies on imported oil for nearly half its requirement currently, has already seen domestic production peaking, said Lin. "The increase in China's oil consumption in future may all come from overseas oil reserves." Here is another case of a publicly funded Canadian public sector pension fund being used to take over a U.S. company forced into bankruptcy by private hedge funds. The teachers in Ontario who are shareholders in the Ontario Teachers Pension Fund have no say in their pension investments. In fact none of us have any say in our pension funds and how they are invested. I wonder if the shareholders in the Ontario Teachers Pension fund will sleep easy knowing that their money is being used to payout a corporate hedge fund shark that led this company into bankruptcy in order to satiate their greedy need for profits. The irony of all this of course is that the use of the vast pool of pension capital that these private hedge funds need to use to back up their deals is of course social capital as I have pointed out here before. In fact you could call this socialism by any other name if you worked for the Fox network. The Ontario Teachers’ Pension Plan has gotten in bed with Simmons Co., agreeing to buy the struggling company’s bedding unit in a $760-million cash-and-share deal. Two of the world's largest mattress makers are jumping into bed together, with Simmons Co. and its iconic Beautyrest products joining Serta Mattresses in the Ontario Teachers' Pension Plan portfolio. By taking the mattress maker out of bankruptcy protection, Teachers and its partner Ares Management LLC will become the largest player in a traditionally recession-proof industry, which has been ravaged by the credit crunch.In Simmons, the pension fund is buying a 139-year-old company that has now seen six private equity owners since being taken private 20 years ago. The mattress maker began seeking a way to restructure its $1-billion (U.S.) debt earlier this year, as sales skidded 19 per cent. The prepackaged bankruptcy restructuring plan announced yesterday will cut debt to $450-million, with Teachers and its partner paying $760-million for Simmons Bedding Co., its U.S. subsidiaries and parent company Bedding Holdco Inc. Simmons Co.
Mattress makers Simmons and Serta are planning to dethrone competitor Sealy as the world's largest mattress company in a $760-million U.S. deal that includes Simmons filing for bankruptcy. Simmons Co. said Friday that it has put together a restructuring plan to be sold to private-equity firm Ares Management LLC and a unit of the Ontario Teachers' Pension Plan, which owns competitor Serta. Together, Serta and Simmons, which will continue to operate as separate companies and brands, will have a bigger share of the market than world leader Sealy Corp.
Simmons, which is owned by private equity firm Thomas H. Lee, has been negotiating with lenders and creditors since late 2008 as a heavy debt load and a decline in demand squeezed its profits and caused it to miss financial targets required by a loan associated with its 2003 buyout. The company said the pre-packaged restructuring plan has more than the two-thirds support from its noteholders and lenders needed and will reduce its debt to about $450 million from $1 billion. The deal includes about $310 million in new equity from Serta's owners. The company will put the plan out to a vote soon and expects to file for bankruptcy in 30 to 60 days, a Simmons spokesman said. The bankruptcy could then take up to an additional two months, he said. Under the plan, senior bank lenders, trade vendors, suppliers and employees will be repaid in full. Holders of senior subordinated notes will receive 95 per cent on the principal amount due or $190 million and holders of discount notes in the holding company will receive a payout of $15 million on the $269 million in principal, a company spokesman said. Investors in a $300-million loan that was taken out in 2007 will not be repaid as part of the financial restructuring plan. The loan, like the discount notes, paid dividends to its owner. The mattress industry has been attractive to private equity buyers because of the steady cash flow the businesses had provided before the recent broad decline in consumer spending. Sealy is owned by buyout firm Kohlberg Kravis Roberts & Co. It also restructured its debt earlier this year. The downturn has reached out across the mattress sector. Foamex International Inc., a maker of polyurethane foam used in mattresses; Consolidated Bedding Inc, which makes the Spring Air mattress brand; and retailers including 1-800-Mattress and Mattress Discounters Corp have all filed for bankruptcy. As of June 27, the Simmons said it had $896 million in assets and $1.26 billion in liabilities, according to regulatory filings. It said it had $67 million in cash. In our world almost anything can become a commodity. Still it came as something of a shock to read in last Sunday's New York Times how Simmons Bedding Co., a producer of some of our most comfortable commodities, was turned into a commodity itself and sliced, diced and mangled in the process. "But Thomas H. Lee Partners of Boston has not only escaped unscathed, it has made a profit. The investment firm, which bought Simmons in 2003, has pocketed around $77 million in profit, even as the company's fortunes have declined. THL collected hundreds of millions of dollars from the company in the form of special dividends. It also paid itself millions more in fees, first for buying the company, then for helping run it. Last year, the firm even gave itself a small raise. Wall Street investment banks also cashed in. They collected millions for helping to arrange the takeovers and for selling the bonds that made those deals possible. All told, the various private equity owners have made around $750 million in profits from Simmons over the years." On the other hand, the Times points out, this is devastating news for Simmons' employees, bondholders and other investors ("Profits for Buyout Firms as Company Debt Soared"). As citizens of our society, we tend to think that companies are primarily in business to produce goods and services that are useful and fairly priced. At the same time, we are dimly aware that, for the financial industry, businesses are commodities themselves -- to be exploited as much as possible for the financial gains they offer to those who buy and sell them, break them up, recapitalize them, and sell off their assets. Private equity firms can determine if the business is overpriced or underpriced, has disposable assets, significant liabilities, is a good candidate for a takeover, and so forth. And, indeed, huge sums of money can be made by leveraging the assets of such companies, as the Simmons case illustrates. Usually the rest of us do not grasp what is going on behind the scenes, though we read about the acquisitions and sales, the name changes and mergers. The owners reap windfall profits, often ending up placing the companies in extremely exposed and vulnerable positions. It would be like a homeowner who uses his home to back an equity loan to buy another home, strips it, and then sells it to someone else. Or a tenant who renovates extensively and manages to charge the home itself for the cost. Homeowners, alas, can't do that -- as we have learned again and again. They are stuck with the expense and the loss. In considering reforms to our financial industry, we might want to consider such forms of abuse, costly to employees, communities that accommodate businesses, as well as other investors who find themselves empty handed at the end of the process. But first we have to wake up to the fact that the producers of commodities become commodities themselves for an industry that often has little regard for their intrinsic value. Ares Management LLC (“Ares”) is an independent Los Angeles based investment firm with over 90 employees and over US$7 billion of committed capital under management. Founded in 1997, Ares specializes in originating and managing assets in both the private equity and leveraged finance markets. Ares’ private equity activities are conducted through the Ares Corporate Opportunities Fund, L.P. (“ACOF”). ACOF focuses on injecting flexible, long-term junior capital into undercapitalized middle market companies to position them for growth. Ares’ leveraged finance activities include the acquisition and management of bank loans, high yield bonds, mezzanine and special situation investments, which are held in a variety of investment vehicles. Teachers' Private Capital is the private investment arm of the C$85 billion Ontario Teachers' Pension Plan, which invests on behalf of 255,000 active and retired teachers in Ontario, Canada. With more than C$7 billion in assets, Teachers' Private Capital is one of Canada's largest private investors and is currently working with more than 100 companies and funds worldwide by providing long-term flexible financing. Significant investments include Samsonite, Worldspan and the recently purchased Alliance Laundry Systems in the U.S., and Maple Leaf Sports and Entertainment, Parmalat Canada, Yellow Pages, and Shoppers Drug Mart in Canada. Teachers' Private Capital specializes in providing private equity and mezzanine debt capital for large and mid-cap companies, venture capital for developing industries, and financing for a growing portfolio of infrastructure and timberland assets. Canadian pension funds are in good shape to benefit from a recovery in the markets, according to rating agency DBRS, provided they don’t try to overcompensate for a brutal year by taking excessive risks under improving conditions. Here’s a quick reminder of how some of the funds fared in their last fiscal year – Caisse de dépôt et placement du Québec was down 25 per cent, Canada Pension Plan Investment Board was down 18.6 per cent, Ontario Teachers’ Pension Plan Board was down 18 per cent, OMERS Administration Corp. was down 15.3 per cent and the Public Sector Pension Investment Board was down 22.7 per cent. “The poor investment performance had the effect of significantly shrinking their asset base and eroding their funding position, suggesting that the risk level in certain portfolios may have been higher than originally measured,” they wrote. They say there are five reasons the funds deserve their top ratings and are likely to prosper in the coming years. Hugeness: The funds “continue to benefit from very large asset bases,” ranging from $33.8-billion to $120.1-billion. Meanwhile, “recourse debt remains very low... as such, these credits enjoy, at all times, access to unencumbered assets several times in excess of recourse debt, providing considerable flexibility in the face of adverse financial developments." Mandatory members: Most funds are funded by employees and their employers, which means any shortfalls are likely to be backfilled by the government in the case of public funds. These workers also tend to keep their jobs, which keeps the coffers full as they keep contributing through economic downturns. Liquidity: Most of the funds have large pools of liquid assets, which can be flipped if needed to cover losses. “Under DBRS’s liquidity policy, public pension funds and asset managers issuing commercial paper are required to maintain high-quality liquid assets (defined by DBRS as cash, debt securities of AAA-rated sovereigns, provincial governments and government-guaranteed entities, as well as R-1 (high) short-term Canadian bank notes) in an amount equivalent to at least 1.5 times the limit of the commercial paper program." A LEED rated Green School in Halifax is suffering from a leaky roof, toxic VOC's and boiler maintenance problems only a year and a half after being built. Green buildings may not be as energy efficient as they claim to be. Using recycled materials and putting sod on the roof is asking for trouble, predominately water seepage. Perhaps more efforts should have been put in to the boiler system instead of making the school a modernist penitentiary. Security cameras, panic buttons, washrooms without doors and extra-wide halls designed to prevent conflict between jostling individuals: Is this a new Canadian super-max penitentiary? Far from it. Welcome to Halifax's Citadel High School, likely the safest educational institution in the country. The Halifax regional school board finally concluded Wednesday that 11 degrees was too cold for studying at central Halifax’s only high school. A faulty steam pipeline under Summer Street that heats Citadel High School — and has been under repair for months — still wasn’t working in the morning when the temperature dropped in the city. Parents were first told to bundle up their kids and send them to school anyway, but the board eventually decided to send students home later in the morning. One parent was upset that the school board had not made a clear decision earlier and that the $31-million school, built in 2007, was having more problems. "They’re certainly working as quickly as they can," said Cathy MacIsaac, a Transportation Department spokeswoman. "The delay was related to receiving the pipe and the pipe is on its way." Her department is overseeing the work. Heating issues have closed the school before. Earlier this summer, workers tried to find out what was wrong with the pipeline. The province found that a high water table in the area was creating problems for the pipes that heat the school. Cold water in the soil was making it difficult for the pipes in the heating system to work properly. Repairs were needed. They included waterproofing manhole covers, replacing valves and replacing the piping itself. Ms. MacIsaac said that the repairs are almost done and that the specialized piping should arrive today. Installation work should take about three to four days. "Our staff are working with (the school board) to try and put in some temporary heating so the teachers and students can get back in, in a comfortable environment," she said. School board spokesman Doug Hadley said an external boiler will be temporarily connected to the building’s hot water and in-floor heating systems. Six heating units with fans will also be brought in. Mr. Hadley said the school board would be in contact with parents Wednesday night, but the plan was to have the school open Thursday morning. Citadel High School replaced St. Patrick’s and Queen Elizabeth high schools as part of a $400-million provincial program to build and renovate schools around Nova Scotia. The school has experienced a number of problems since its completion, including poor air quality and leaky roofs. The repairs on the steam pipe will cost about $200,000. Ms. MacIsaac said that at least a portion of the cost is likely to be covered by a contractor’s warranty. The underground piping system that heats Citadel High School in Halifax is out of commission for the second time in less than a year. Officials with Nova Scotia's Department of Transportation and Infrastructure Renewal said ground water is leaking into nearby manholes and causing the pipes to leak steam. "They don't work as efficiently as they should," Lindsay Mills said Monday. The $25-million high school, which opened in September 2007, is designed to be heated with steam generated at a nearby hospital and directed to the school using underground pipes. The same underground system, running from the QEII Health Sciences Centre, also heats the Nova Scotia Museum of Natural History. Neither building, however, is getting heat from the steam transfer system. "We are looking into that to figure out the origins and what really went wrong," Mills said. Crews have dug three pits in the area as they try to make the piping waterproof and replace manholes and steam fittings. Mills said the problem, which will cost an estimated $225,000 to fix, first surfaced last year when a leaking pipe sent steam billowing out of a manhole for several weeks. She said the repairs should be complete by late October, and consultants will determine who will pay for those repairs. Halifax's 16-month-old Citadel High School has a leaky roof. School officials used buckets to catch the water as it dripped through the ceiling above the gymnasium on Thursday. "At that point it was dripping not in any great amounts but coming in in more than one area," said Shaune MacKinlay, spokeswoman for the Halifax regional school board. MacKinlay said the building is still under warranty so the board won't have to pay for repairs. Contractors were expected to go to the $30-million school on Friday to fix the roof. Citadel High opened in September 2007. One of the highlights of the school is that it adheres to the international Leadership in Energy and Environmental Design (LEED) standards for sustainable, green benefits. reduces the cost of the construction. beams/steel decking were painted and lit with suspended lighting. clean open-ceiling approach and a reduction in the overall height. justify the more costly beam approach. A hypothesis is a theory looking for facts. That it is taken as 'fact' due to popular consensus does not make it so. Even if those who make up that popular consensus are scientists. Going back to the planetary drawing board, Dr Prentice revisited the work of legendary French mathematician Pierre-Simon Laplace, whose late 18th-century nebula model was abandoned after less than a century. In Dr Prentice's modern Laplacian theory, as he calls it, the original cosmic cloud of gas and dust, which was once part of the galaxy, sheds a concentric family of orbiting gas rings as it contracts inwards from Neptune's orbit. "The material from which the planets formed was thus once concentrated in a system of very narrow and dense rings of gas, one for each planet, rather than being spread out thinly as a disc," he says. Dust and ice grains condensed out of each gas ring to form a growing core of solids - the embryos of today's suite of planets. The inner solar system's rocky cores became the terrestrial planets of Mercury, Venus, the Earth and Mars. The outer solar system's cores of rock and ice grew big enough to capture great gaseous envelopes, thus becoming the gas giants, Jupiter and Saturn, and the outer planets, Uranus and Neptune. "Because the gas within a gas ring is 100 times denser than that of the nebula disc model, the planets form 100 times faster," he says. Instead of being created in 2.5 million years, Saturn takes only 25,000 years. Neptune and Uranus form within 100,000 years. "These times lie well inside the 1 million year cut-off time." As well as explaining the orbits and masses of HR 8799's newly discovered planets, his model predicts many key aspects of the chemical and physical structure of our own solar system's planets and their moons. One prediction, to be announced formally this month at a meeting of the American Geophysical Union in San Francisco, relates to the size of Mercury's massive iron core. Another prediction is that, once analysed, the data from NASA's Messenger probe, which flew past Mercury in October, will reveal no significant traces of the volatile elements potassium, sodium or sulphur on the planet's heavily cratered surface. "That is what I expect NASA to announce very soon - I hope," says Dr Prentice. His theory is still widely regarded as heretical, but at least one eminent physicist, Professor Paul Davies of Arizona State University in the US, says it should not be dismissed "out of hand". Scientists' understanding of the solar system's formation is undergoing a review, with the recent discovery of hundreds of planetary systems around other stars, says Professor Davies. "Many of these systems have planets distributed very differently from the solar system, and a lot of head scratching is going on," he says. "The basic science is up for grabs, and we could be in for a big surprise." This years Nobel prize in economics was given to an American Political Economist who for all intents and purposes espouses the anarchist economics of community control, mutual aid and direct action. While much attention has been given to the fact that this was first time a woman was given the award much commentary has been that this was another Euro slap at the rampant liberaltarian free market economics of the U.S. In fact Elinor Ostrom's political economic analysis is far more libertarian than the apologists for U.S. capitalism. Professor Ostrom - who shares the prize with Oliver Williamson of the University of California, Berkeley - has spent much of her career challenging the view that when people share a finite resource, they will inevitably end up destroying it. This widely held belief, known as the tragedy of the commons, is used to support arguments for tighter regulation or even privatisation. She has approached the argument from an unusual perspective, too. Through her study of the way that natural resources have been managed around the world, she has found that, left to manage resources on their own and given the right support, local people often develop the most effective methods of sustainable development. “We have a team of people studying forestry in 200 cities around the world. This is very big study, trying to understand why some forests have just disappeared and others have been sustained. We started in 1992. We have been able to go back and go back and go back to get very good data sets. Professor Ostrom - whose doctorate is in political science and who considers herself a political economist - will not be drawn to comment on hot political issues, such as the push for tighter regulation of Wall Street or the perennial question of American healthcare. They are, she says, not her field. To this end, she is a firm supporter of direct action. “I have recently written a paper on global warming and argued that we should not sit around twiddling our thumbs waiting for someone to do something. We should act now. There is a lot we can all do at all levels,” she said. Well excuse me if I am not surprised that Steady Eddie Alberta's CEO produced a TV show last night that announced nothing new. In fact while some folks bemoan the premier for not being Ralph Klein, including King Ralph his-self, Steady Eddie is living up to his name. In fact he is the ghost of the Tories Past, the actions of his government are just a rehash of Klein's fiscal renovation, of the 1990's. The government is cutting hospital beds and freezing hiring of nurses and doctors, just as Klein did. The are cutting back funding to schools, just as Klein did. They are cutting funding to post secondary institutions just as Klein did. They are calling for a wage freeze for two years for all public sector workers just as Klein did. The debt and deficit hysteria that launched the Klein regime has returned like Marley's ghost to haunt the Alberta Government. Having no plan Steady Eddie returns to the past to find solutions to the Tories Made In Alberta Recession. plan to deal with a crash. The failure to invest the Heritage Trust fund or to fund it adequately led to the current deficit. And yet those in charge of investing both the Trust fund and the new AIMCO investment fund (made up of your and my public sector pension funds) lost the province billions, that now make up part of the current deficit. It was this investment failure that has cost the province much including outrageous buy outs and bonuses to these same fund managers. The province's Heritage Savings Trust Fund lost the $3 billion between March 2008 and March 2009 in the economic downturn, and currently sits at $14.3 billion. The record loss sent Alberta into a deficit for the first time in 15 years. It was the biggest loss in the fund's 33-year history. two AIMCo executives earned a combination of more than $5 million last year even as the funds they managed -- including the Heritage Savings Trust Fund -- lost more than $7 billion. The collapse of oil and gas prices of course added to the deficit but not to the degree that the bad investments of our surpluses did. In fact the decline in natural gas production in the province began back in 2001 and is something that could be planned for, if you had a government that was not adverse to planning. 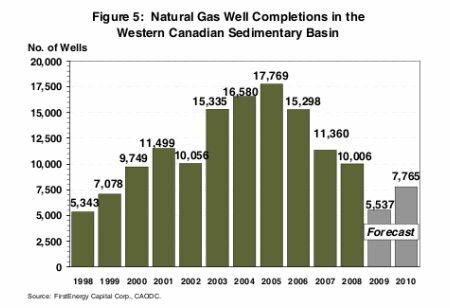 The problem, however, is that production in the Western Canadian Sedimentary Basin (WCSB) is declining. Production peaked in 2001; the vast majority of the country's natural gas is produced in the WCSB. According to Canada's National Energy Board (NEB), Canada's marketable production peaked around 17 Bcf/day in 2001. If we take a look back, 2005 should have been a huge year for Canadian natural gas. That year, we saw the most active Atlantic hurricane season in recorded history. Fifteen hurricanes blew past us. Five became Category 4 hurricanes and four reached Category 5, including Katrina and Wilma. That same year, Canada imported 3.7 Tcf of natural gas to the U.S. However, Canadian production of marketable natural gas fell 1.7%, compared to 2001 levels. According to NEB projections for 2009, natural gas production will sit at 5.5 Tcf — 12% lower than in 2001. Add to that the expansion of infrastructure projects, that under Klein had been halted, as labour costs increased during the boom and you have another reason for the deficit. Finally we have the creation of Hospital Boards, which were to have been publicly elected and were for one term and then when to0 many liberals and dippers were elected the boards were fired by Klein and replaced with Tory hacks. Steady Eddie's first act as Premier was to follow in Klein's footsteps, firing the regional boards and forming a super board, the cost of which was again payouts resulting in the new super board having a half billion dollar deficit. And while Steady Eddie announced a wage freeze for senior government managers it means little when in fact these same managers racked in bonuses worth $6.7 million last year. And we suspect that even if he follows through with MLA and cabinet salary freezes its after the cabinet gave itself and the Premier a 34% increase last year. The other reason for the deficit is that Alberta is business friendly. The cost of doing business in this province is nil, zilch, nada. The working class taxpayers in Alberta shoulder the burden of business costs. And thanks to the generous tax breaks to business the burden of the deficit is shouldered by you and me, and the solution that some are suggesting is the dreaded of all taxes the sales tax. The Progressive Conservative government, in power since 1971, has long had a hands-off approach to business. Foreign investors have long been attracted by the lack of sales, payroll or capital taxes, low income taxes and competitive corporate taxes, at 29 per cent and dropping to 25 per cent by 2012. Despite a current deficit, overall net direct and indirect debt is low, totalling C$1bn or 0.3 per cent of GDP on March 31, according to a recent Moody’s report that gave Alberta a triple-A debt rating. Like the mythical debt and deficit crisis of the Klein years this too is a short term recession, with a temporary deficit. And like then the deficit will be paid off by cutting public sector funding and freezing wages rather than taxing the capitalists. Nothing new here just as there is nothing new with the Tired Old Tories still in power.